Our earth is the fifth-largest planet in the solar system with a diameter of around 7,926 miles or 12,756 kilometres. The Earth's crust is about 5km thick beneath the oceans, but beneath land the average thickness is around 45 km thick. The crust is thickest beneath the himalayan mountans in Asia where the crust reaches up to 70 km thick. Beneath the crust is a different layer called the mantle. Since drilling deep enough to get to the mantle is very difficult we know little about the earth's mantle. The things that scientists do agree on are that between 100 and 200 kilometers below the Earth's surface, the temperatures are high enough to melt rocks. This is where the lava from volcanos comes from. The mantle is believed to be mainly composed of ferro-magnesium silicates. The thickness of the earth's mantle is about 2900 km. Below the Earth's mantle is a extremely dense core of iron. The radius (the distance from the edge to the centre) of the earth's core is about 3500 km. 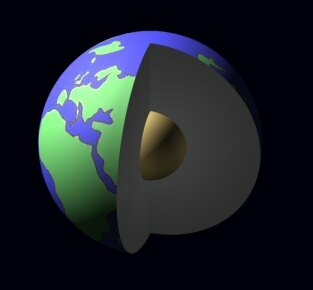 This great lump of iron is what provides the earth with its magnetic field. It is believed that the pressure and temperature are high enough that the centre of the core is permanently molten iron. How hot is the centre of the earth? Our best guess is that the temperature at the centre of the Earth is approximately 4000°C. We cannot go there and measure it ourselves. Do you know how they worked out the diameter of earth? Well now that we can go into space it is easy, but they calculated the diameter of the earth in ancient times using geometry. Why not discover how to do it yourself?